A pleasing and easy to prepare soup that provides warmth and energy to power you through a chilly day. White Bean Soup with spinach,leeks and couscous. It might sound complicated or time consuming but this tasty soup really isn't. In fact, it's pretty easy to make and won;t have you starting three hours ahead of time to be sure it's finished for dinner! 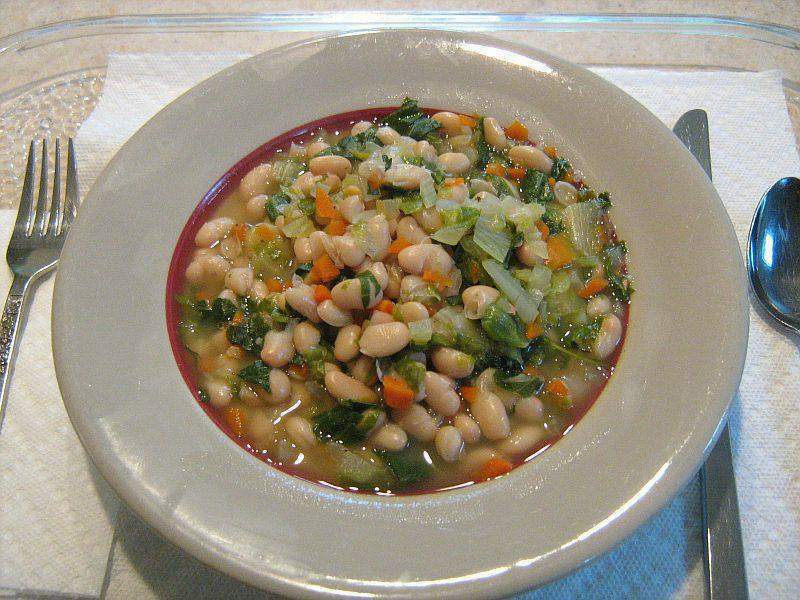 We love any kind of bean soup but this white bean soup is delicious and very nutritious too. It has only about 2 1/2 grams of total fat and a decent amount of protein and fiber. This soup is ideal for a fairly quick meal on a chilly evening - get home from work and within about 30 to 40 minutes you can be serving this delicious white bean soup! We think you'll like it! And don't forget to check out our other delicious soups and stews. Just click HERE. In large soup pot heat oil over medium heat. fragrant, about 2 more minutes. Stir in vegetable broth, beans and bay leaves. Bring to boil; reduce heat to low. Stir in couscous. Cover and simmer for 5 minutes. Remove bay leaf. Garnish with parsley and serve immediately. 30 g carbohydrate, 8 g protein, 7 g dietary fiber, 520 mg sodium.